Need side dish inspiration this holiday season? 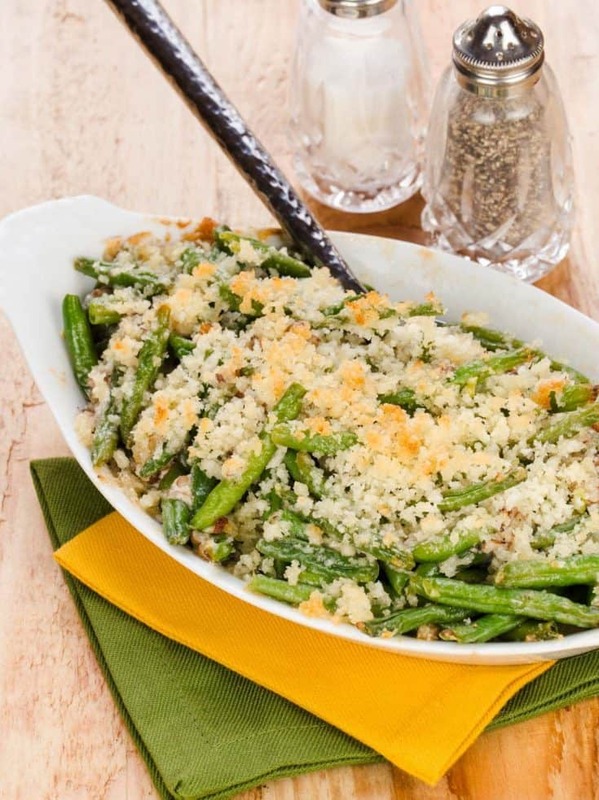 Try this Fresh Green Bean Casserole with Cheese for a spin on an old favorite! As I’ve mentioned in previous posts, my family tends to shake up our Thanksgiving spreads while Lisa’s crew sticks with their favorites year in and year out. 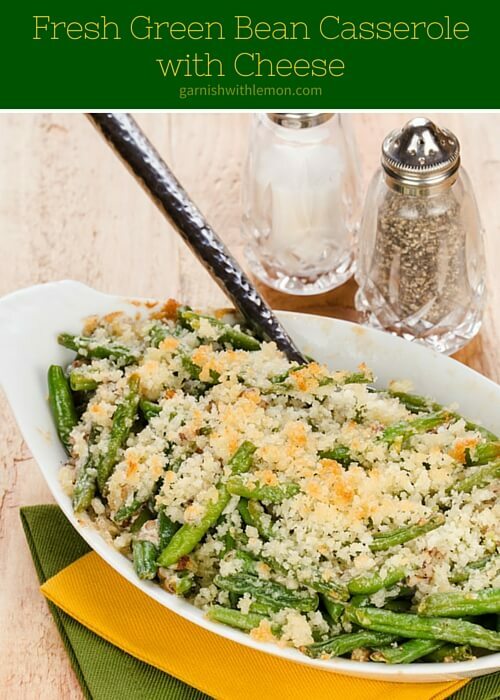 I’m sure there are plenty of die hard Thanksgiving traditionalists out there (especially when it comes to green bean casserole with crunchy fried onions on top), but if you’re interested in something a little bit different but still familiar, check out this delicious Fresh Green Bean Casserole with Cheese – two kinds of cheese, to be exact. Blanched haricot verts (a French term for thin green beans) are used in this dish. You can use regular green beans, but you might have to blanch them for a minute longer to ensure they cook fully after you pop them in the oven. Cream of mushroom soup is replaced by a mixture of tangy goat cheese, parmesan cheese, garlic and a touch of cream, while chopped pecans and cheesy toasted breadcrumbs ensure that every forkful still has a crunchy bite. 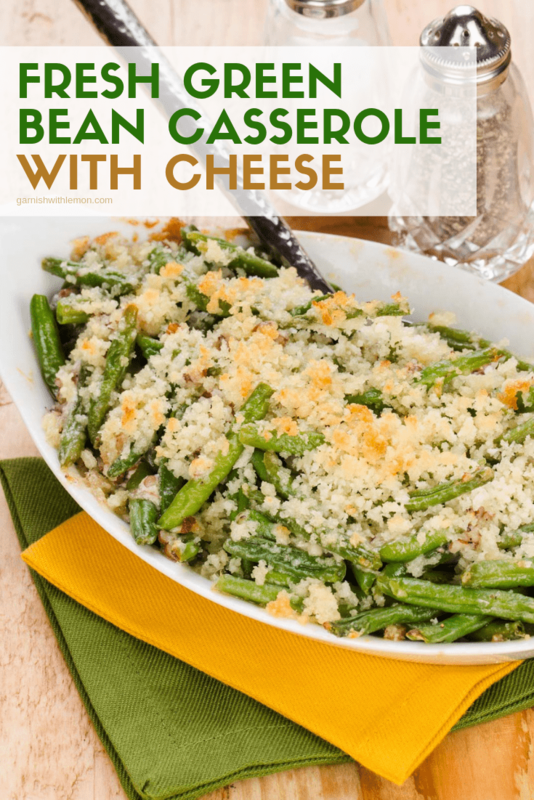 Tip: This Fresh Green Bean Casserole with Cheese can be prepped in advance, just like the tried and true version, and baked along with other side dishes the day of your big meal. If you’re entertaining a small group for dinner, you can also divide the recipe into individual gratin dishes for a fancy-pants presentation. Check out more Thanksgiving menu ideas on our Thanksgiving Pinterest board! Follow Garnish with Lemon’s board Thanksgiving on Pinterest. An updated version of a classic! Combine Panko, 1/2 cup Parmesan and pecans in a bowl. Drizzle in olive oil and gently stir until coated. Bring pot of water to a boil. Cook beans for 3-4 minutes and immediately plunge into ice water to stop cooking. Drain and pat dry with towels. Combine goat cheese, garlic, cream, salt, pepper and remaining cup of Parmesan cheese in a large bowl. Stir in beans and pour mixture into a large baking dish. Cover with foil and bake for 20 minutes. Uncover, sprinkle with Panko crumbs and bake for another 5-8 minutes or until crumbs are golden brown. Let stand for 5 minutes before serving.